« 911: Dublin, Dubai, or Downtown? A key enabler of the move out of normal, legacy, staffed, out the window (OTW) Towers and into remote, staffed/automated, sensor-driven, computer mediated, windowless towers is that the military contractors have developed remarkable technologies in Iraq, Afghanistan, and Pakistan. 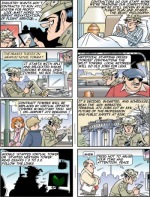 This is about the military-industrial complex looking for peacetime markets. 1. One of the persistent issues in airport capacity at major metro airports is runway occupancy time. The airplane lands, rolls down the runway, maybe the pilot skips a turnoff for a more convenient taxi route, and the next plane can’t depart until the first one gets off the runway. We could really improve runway occupancy time using military technology. We could put an arresting hook on the tail of the airplane, string heavy-duty cables across the end of the runway, and let the airliners “take the gear”. They’ll get off the runway a lot quicker. 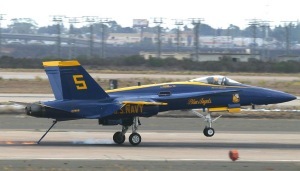 Not so fast, you might say – there are things acceptable in military aviation that are not acceptable for domestic, civilian passenger flights. Let’s explore that. 2. 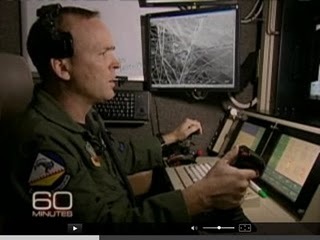 Military pilots sit at computer consoles at Creech Air Force Base, using joysticks and keyboards to fly military aircraft in real-time. They fly surveillance, missile attack, and search and rescue over Iraq, Afghanistan, and Pakistan. It’s an extremely cost-effective program – they don’t have to house the pilots in-country, they just datalink the skill set and they’re in business. They found out they don’t need highly trained officers – a lot of high school kids turned non-coms have the joystick skills. Question: Would you approve of using similar technology for regional airlines flying passenger service in the United States? It would certainly save money and resolve some union issues. Would you be comfortable sitting in the back of a pilotless regional jet? How come? 3. Combat information systems now integrate a wide variety of information sources to represent the entire battle space on a ruggedized laptop screen. Generals in bunkers and Sergeants in humvees use the screens to coordinate their operations. Industry wants to use “virtual towers” (and lately, Nextgen Towers) to sell these military systems as civilian systems. 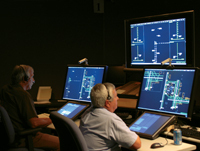 Question: Would you approve of using similar sensors and displays to move the coordination of airport activity from traditional control towers to off-site windowless control centers? Would you be comfortable with your family flying in to the airport late at night, when the virtual controllers have gone home and the airport is operating as an Automated NextGen Tower? On your last point: Just about every regional carrier has late-night flights into their outstations that arrive well after the tower has closed. Other than dispatch and maybe a frequency used by their ramp agent, they aren’t talking with anybody, just transmitting on CTAF. Do most passengers know that? Probably not. It doesn’t necessary decrease safety, either. Pilots all once trained on uncontrolled operations and the plane still has TCAS. The FAA can make a strong case for rolling out SNT/ANT first at airports that currently don’t have control towers. “Look, a great range of services for users, an extra set of eyes and more safety! Rest assured during your late-night landing that someone is keeping an eye on your flight where once you were flying blind.” That’s a pretty easy argument to make, and frankly a compelling one if done right. So what’s the counter argument? Sure, SNT/ANT seems like a poor alternative to staffed towers, but what about at airports where the tower shuts down at 9pm or 10pm? What about at airports with no control tower in the first place? Isn’t SNT/ANT a good addition? Staffed Virtual Towers is a bad idea if it is used as a replacement for sets of eyes looking out the window. A controller three states away is not going to see the lightning to the west, the snow squall moving in from the north, the sparks on the runway because of a gear-up/collapsed gear landing, a compressor stall with flames shooting out the back of a DC9 engine, birds flying across the final, deer crossing the runway, whether landing gear appears fully extended, the color of an aircraft in the pattern and a whole host of other things. If it is used as an ENHANCEMENT to provide safer service at towers that don’t have ground radar now to increase safety, that’s a different story. It’s giving us more to see than we could have if the weather prevents us from seeing the above mentioned events. The danger of Automated Virtual Towers, in my opinion, is that it might give the appearance to the pilot/passengers that they are receiving more service than they are and that someone really is watching when they’re not. Automation is not always right. Just ask an Airbus pilot.